Robert Morris, Untitled (Passageway), 1961. Photo Courtesy Castelli Gallery, New York. © 2014 Robert Morris / Artists Rights Society (ARS), New York. S, M, L, XL is the title of a book of projects by Rem Koolhaas’s architectural firm OMA, ranging from the small, to extra-large. It is also the title of a current show at the Museum of Contemporary Art Chicago, featuring work on a similar range of scale, all united by the theme of making “sculpture more accessible.” The four works of the show have a similar challenge facing them to that of architecture. 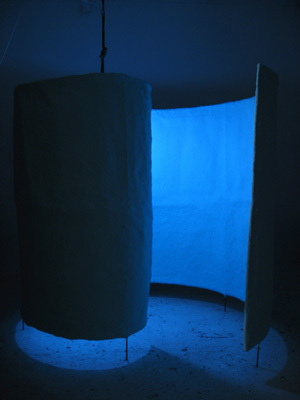 These works must tackle the task of moving humans through space against their will, while allowing the humans to feel as if their will is not being violated, and in fact, their motions are of their own volition. The problem, of course, is that the scale of humanity is not getting any smaller. Our cities are crowded places, and although even a city like Chicago has fantastic space available for the arts, to make work accessible means confronting the economies of moving a large number of people through a limited space successfully. Our architecture has developed to allow people to feel free, even though we must be constrained by reality. Subway cars, elevators, high-rise apartments, sidewalks, lobbies, and public squares–all of these designed spaces are about compromise, about matching control with freedom. Similarly, the gallery makes compromises. Free days versus admission fees, photos allowed or not allowed, the ability to walk around the art placed free-standing but not to cross the velvet rope, and of course, looking without touching. Kris Martin, T. Y. F. F. S.H., 2011. Collection of the Museum of Contemporary Art Chicago, gift of Mary and Earle Ludgin by exchange. © 2011 Kris Martin. Photo: Nathan Keay. The interactive features of the work in S, M, L, XL emphasize a connection between the viewer and the piece, but docents are standing by to make sure that this connection happens according to design. Robert Morris’ Portal, a slender archway constructed from white wallboard, is not to be touched as one passes through it. Text on the floor instructs the viewer, and a docent watches with authoritative gaze. Blue by Franz West allows the viewer to sit in a chair surrounded by material, but the docent allows only one person at a time to do so (“take a blue selfie,” she suggested to me) and manages the waiting line to one side. T.Y.F.F.S.H. 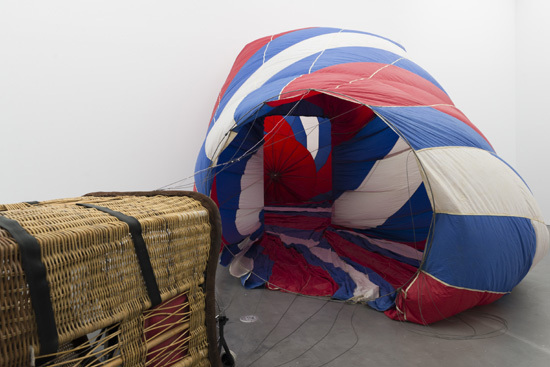 by Kris Martin is the XL piece, with a hot-air balloon filling an entire room within the gallery, inflated by whirring fans. But one must remove one’s shoes before entering, to avoid damaging the material. The skin of the flying machine blocking doors and windows with a colorful membrane is an artistic imposition, by the docent minding that visitors follow the rules is a more utilitarian variety. Franz West, Blue, 2006. Collection of the Museum of Contemporary Art Chicago, gift of the William J. Hokin Family. Courtesy of the Estate of Franz West and the Franz West Privatstiftung Archiv. Photo: Heiri Häfliger, Franz West Privatstiftung. I don’t suggest that we have entirely libertarian art galleries where work can be ground into dust by viewers if the mood strikes them (although a few would be interesting), but this form of “accessibility” does affect the aesthetics. Buildings cannot be constructed out of such delicate materials. They must stand up to wear and tear. Graffiti-proof surfaces and anti-climb and anti-sit fixtures are now hallmarks of inner-city architecture. And yet, I did notice some small damages to Martin’s balloon skin. Fingerprint smudges on Portal were visible, leading me to notice others on the wall of the gallery–probably not part of the installation, but now drawn into it. The light within West’s spiral was, indeed blue, but the hanging light bulbs appeared to be off. Was this the intention, or had their burned out, as light bulbs do? There is a relationship between what we expect, and what we get, between what is ideal, and what is real. Paint fades, carpets become stained, windows get dirty and crack. Built objects, whether sculpture or architecture, eventually degrade as part of their existence. Sculpture’s freedom to do so is beautiful, and so is the way that humans always find a way to avoid the constraints placed upon them, no matter how well designed.